On Friday, Aug. 16, Robert Pattinson, actor and star of mega-hit movies ''The Twilight Saga'' and ''Water for Elephants'' dropped by Children’s Hospital Los Angeles to spread cheer and visit with patients. Teens from across the hospital—including the Acute Rehabilitation Center, the Children’s Center for Cancer and Blood Diseases and The Heart Institute—gathered in the hospital’s Teen Lounge for a surprise guest. When Pattinson arrived, one young girl giggled and cried in awe. But the down-to-earth actor quickly settled the room and jumped into arts and crafts, decorating picture frames alongside patients. Pattinson laughed at his own creation—a pink frame with hearts sketched in—and tried unsuccessfully to convince the room of his ''terrible'' artistic skills. 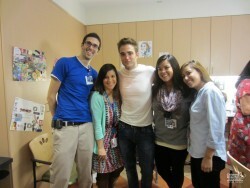 The star graciously posed for endless photographs and signed every patient’s picture frame before heading off to visit two cystic fibrosis patients and huge ''Twilight'' fans who were unable to leave their rooms. ''Robert was so nervous about meeting the kids—he didn’t want to let them down—which is a testament to how humble he is. He was incredibly gracious and kind. He will probably never fully understand what a huge lift he gave to these kids today, and how it will positively impact them over the long term,'' shared Child Life specialist, Ana Vega. Pattinson was able to visit the hospital because an upcoming movie, ''Maps to the Stars'', which Pattinson is currently filming in Los Angeles will feature a short scene (not featuring Pattinson) in front of Children’s Hospital Los Angeles. Keep an eye out for Children’s Hospital Los Angeles when the film hits theaters!